Snowflake Maple Cookies are soft maple and ginger holiday cookies, with vanilla cookie icing, topped with sparkling sugar. Preheat oven to 375 F (190 C) and line two cookie sheets with parchment paper. In a small bowl, whisk together flour, baking powder, baking soda, salt, ginger, cinnamon, and cloves. In bowl of stand mixer with paddle attachment, beat softened butter, brown sugar, and egg until well blended. Add maple syrup, honey, and vanilla. Gradually spoon in dry ingredients, continuing on medium high until blended and smooth. Sprinkle rolling surface and rolling pin with flour. Cut out cookies using a 3.5 inch snowflake cookie cutter. Space cookies 1 1/2-inches apart on cookie sheet. Bake 6-8 minutes until edges start to brown. Place pan on rack to cool for 10min before removing cookies. 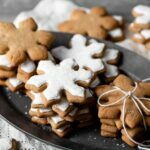 Use homemade or store bought royal cookie icing. Pip a thin trace line around the edges of the snowflake.Then pipe icing to fill in star shape. Take a toothpick and move icing to cover bare spots. Sprinkle wet icing with sparkling sugar. Pour some milk, scoop some peppermint ice cream, and enjoy!